This month we first discussed what bullying is, then we discussed how to recover from or prevent bullying, and last week we discussed what to do if you see someone being bullied. It seems like everyone wants to be unique and create their own stamp on the world. On the other hand, many people have a hard time embracing the wide variety of “different” characteristics and beliefs that make people unique. I recently read the speech author Lois Lowry gave when accepting the Newbury Award in 1994 for The Giver. Her take on “sameness” bringing comfort and how her college roommates shunned a girl because she wasn’t the same as them is certainly thought provoking. The Dark Days of Hamburger Halpin by Josh Berk – When Will Halpin transfers from his all-deaf school into a mainstream Pennsylvania high school, he faces discrimination and bullying, but still manages to solve a mystery surrounding the death of a popular football player in his class. Does My Head Look Big in This? by Randa Abdel-Fattah – Year Eleven at an exclusive prep school in the suburbs of Melbourne, Australia, would be tough enough, but it is further complicated for Amal when she decides to wear the hijab, the Muslim head scarf, full-time as a badge of her faith–without losing her identity or sense of style. The Skin I’m In by Sharon Flake – 13-year-old Maleeka, uncomfortable because her skin is extremely dark, meets a new teacher with a birthmark on her face and discovers how to love who she is and what she looks like. Stargirl by Jerry Spinelli – In this story about the perils of popularity, the courage of nonconformity, and the thrill of first love, an eccentric student named Stargirl changes Mica High School forever. Empty by K. M. Walton – Deeply depressed after her father cheated on and divorced her mother, seventeen-year-old Adele has gained over seventy pounds and is being bullied and abused at school. Diary of a Witness by Catherine Ryan Hyde – Ernie, an overweight high school student and long-time target of bullies, relies on his best friend Will to watch his back until Will, overwhelmed by problems at home and guilt over his brother’s death, seeks a final solution. It Gets Better: Coming out, overcoming bullying, and creating a life worth living – A collection of original essays and expanded testimonials written to teens from celebrities, political leaders, and everyday people. This list of books can be found on a list of swtteen’s profile called: Bullying, unique circumstances. This entry was posted in Activism, Book Lists, Read This! and tagged Australia, biographies, bullying, fiction, high school, murder, realistic fiction, religion on February 4, 2014 by pushtotalkteens. You overhear a group of teens discussing someone they all don’t like. . Someone who used to hang out with your friends is now no longer included in the group, and you’re asked to not spend time or talk to that person. . . I asked two teen volunteers who attend Chief Sealth High School about whether they see bullying in their school. Both volunteers said that bullying isn’t really an issue in their school, and at most students just ignore people they don’t want to talk to or be around. Is that what it is like in your school? Do you think the media has overblown the issue of bullying? Leave a comment and tell us your opinion. What if you DO observe someone being bullied, what can you do? Today we present a list of books featuring characters being bullied and how it impacts those around them as well as a couple of books that show how to stop bullying you may observe. Poison Ivy by Amy Goldman Koss — In a government class three popular girls undergo a mock trial for their ruthless bullying of a classmate. Hate List by Jennifer Brown – Valerie can’t tell if she’s a hero or a villain after her boyfriend Nick shoots those on the hate list they’ve created together. Bruiser by Neal Shusterman – When twins Tennyson and Brontë befriend a troubled and misunderstood outcast, nicknamed Bruiser, they realize they can use him to make their lives better, but should they? Th1rteen R3asons Why by Jay Asher – Clay receives a box containing 13 cassette tapes from a classmate who committed suicide, and each tape represents a person, a reason, why she committed suicide. Speak by Laurie Halse Anderson – A traumatic event near the end of the summer has a devastating effect on Melinda’s freshman year in high school. This entry was posted in Activism, Book Lists, Read This!, Watch This! and tagged bullying, fiction on January 28, 2014 by pushtotalkteens. You went to a party over the summer where you were attacked and called the cops for help. Everyone gets busted, and you are on the receiving end of their anger once school starts. . .
You shared a picture of yourself with your boyfriend or girlfriend that you thought would stay private, but it didn’t and now you’re being called nasty names in person, online, and/or on your phone. . .
What do you do if you’re being bullied now or are trying to recover from being bullied? Take a look at the following resources for help from teens and experts and get inspired by a few of our favorite fictional characters who were able to recover (slowly) from being bullied. Everybody Sees the Ants by A.S. King – After one particularly brutal beating by the local bully, Lucky Linderman visits his relatives in Arizona, where he finds new perspective on life. This entry was posted in Activism, Book Lists, Community, Read This!, Watch This! and tagged bullying, realistic fiction, self-perception on January 21, 2014 by pushtotalkteens. You had a great group of friends, but they seem to have all turned against you. They group up, look at you as you walk down the hall, whisper something to each other, and then laugh at you. It’s bad enough you’re being called names at school, now someone has been sending them to your phone too. . . 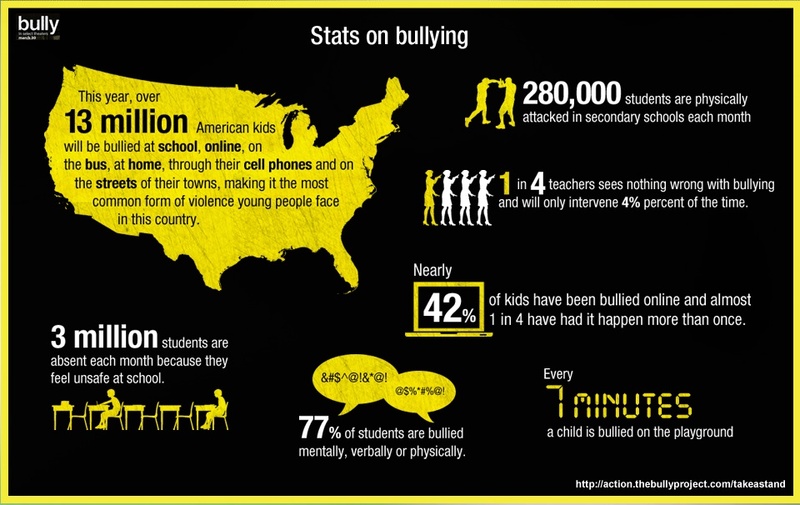 The crew here at PTT knows bullying is a reality for many teens. Over the next few weeks we’re going to highlight articles, websites, videos, and books that can help anyone who’s being bullied, knows someone who’s being bullied and wants to help, or who just realized that they’re bullying someone else. Today’s resources are an overview about what bullying is. Next week we’ll have resources about how to prevent and/or recover from bullying. This entry was posted in Activism, Community, Libraries, Read This!, Seattle and tagged Book Lists, bullies, bullying, cyberbullying, realistic fiction, science fiction on January 14, 2014 by pushtotalkteens. Teen editorial: Are schools doing enough to stop bullying? Recently a teenager from Ohio shot and killed three students and injured two others. He now awaits trial. I bring this up because he was allegedly a victim of bullying. And that may have possibly contributed to the reason behind the deadly attack at Chardon High School. Another reason this has really caught my attention is because a problem with my sister and her friends teasing another little girl was recently brought to my parent’s attention. According to that little girl’s parent, this had been going on for months. I could probably have not been more disappointed in my sister. All I can think is, why? Why do things like these have to happen? Because I honestly think it’s pointless to make another person feel bad about themselves. Another thing my mom made clear in addressing the family about my sister’s case: TEACHERS DIDN’T DO ANYTHING TO TRY TO STOP THIS. It had been going on for months and teachers have done nothing. It’s utterly disappointing. A few months ago a fellow student of mine was mentioning a girl that had killed herself because she was being bullied. I replied by saying how horrible it was. Her response was simply, “Yeah, it happens all the time.” And I couldn’t believe what I was hearing. The simplicity and plainness in her response infuriated me. She acts as if it’s no big deal. It’s a HUGE deal. Whatever schools are doing to prevent and stop bullying is far from enough. And something needs to be done. This entry was posted in News, OMG Controversy!, Opinions, School News, Teen Powered and tagged bullying, Opinions, schools, written by teens on March 15, 2012 by Teen Blogger. I am lucky. I don’t remember any serious bullying in my K-12 years, nor any particular people who stood out as bullies. And yet, there is something thrilling about reading about bullies and their victims, hoping against hope that the victims will stand up, turn around, and face the person they fear most, no matter what it costs them, because in the end, they have nothing left to lose. Here are four recent books about bullies. Ishmael Leseur is certain that his name is the cause of his unhappy school life as the victim of the worst bully in his class, but when a new boy arrives, he shows Ishmael that things could be different. Gray, bullied at school and ridiculed by his unfeeling father for preferring drums to hunting, goes on a shooting rampage at his high school. Longing to be part of the in-crowd at her exclusive London school, orphaned, sixteen-year-old Scarlett, a trained gymnast, eagerly accepts an invitation to a party whose disastrous outcome changes her life forever. Miriam – poetic, smart, and quirky – is considered a freak by the popular girls at her middle school, and she eventually explodes in response to their bullying, revealing an inner strength she did not know she had. This entry was posted in Four on a Theme and tagged bullies, bullying on January 26, 2009 by pushtotalkteens.